Saxophonist, flautist and clarinetist, was born in Emilia Romagna, but when he was in Italy, has always lived in Milan. In the Seventies, he began his experience as a sound engineer, testified by wonderful recordings for various labels. All discs recorded by him, are distinguished by the color and clarity of sound. His contribution to music has been enormous and, as often happens, undervalued in life and discovered too late. 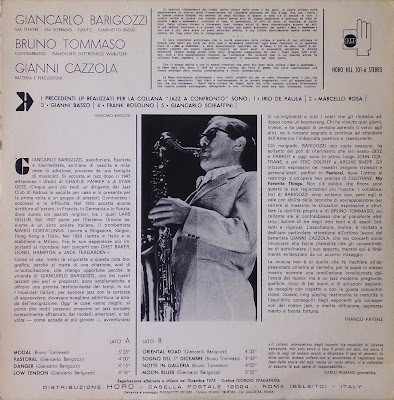 His approach to jazz after 1945, through the recording of Charlie Parker and Stan Getz.Five years later, a leader of the Jazz Club of Padua, listens casually and presents him, for the first time, to the Italian public. 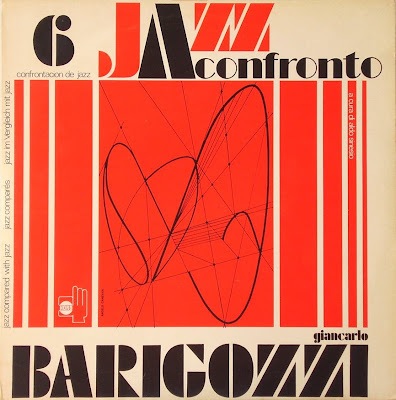 Already in 1953 he recorded two sides for Columbia, with Eraldo Volonte, Gil Cuppini and other, but, despite the successes, for Barigozzi in our small country begin the difficulties. In 1955 he accepts some records abroad, in France, Germany and Sweden. Two years later, Barigozzi decides to leave for the Far East, with the italian trumpeter Mario Costalunga. For several years will play his music between Singapore, Saigon, Hong Kong and Tokyo. In 1965 he returned to Italy and performs some of his most important experiences in jazz, playing with Chet Baker, Lionel Hampton and Jack Teagarden. Many of his recordings, among which I like to remember in addition to this, the quartet recorded in 1971 for the DIRE, "Flautissimo" and "Woman's Colours", both recorded for FONOVIDEO. A4) Low Tension - 4'18"
B1) Oriental Road - 4'33"
B2) Sogno del 1° Dicembre - 4'43"
B3) Notte in Galleria - 4'05"
B4) Moon Blues - 3'55"
Many thanks, JFI! No doubt one of the best Horo-records and thus one of the best Italian jazz albums I've ever heard!